So my daughter turned one year old this weekend, and this was made especially sweet because when she was born, we didn't know if she would see the end of the day. 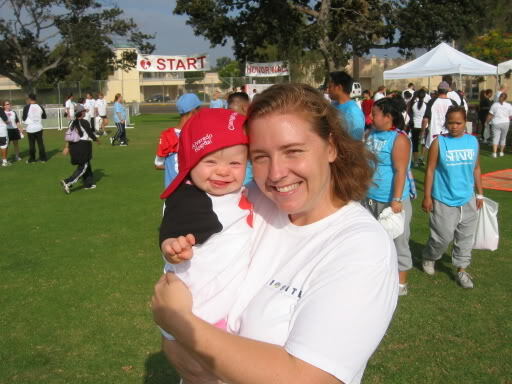 We celebrated both days, first we did the San Diego heartwalk to raise money for the American Heart association. Tori has a VSD, but she has managed to heal the hole from 9 mm to 4mm thanks to proper medication and management at children's hospital. As you can see, she had a great time, but I would too if I didn't have to do the walking! Today we partied with 60 of our closest friends/family at our favorite park. 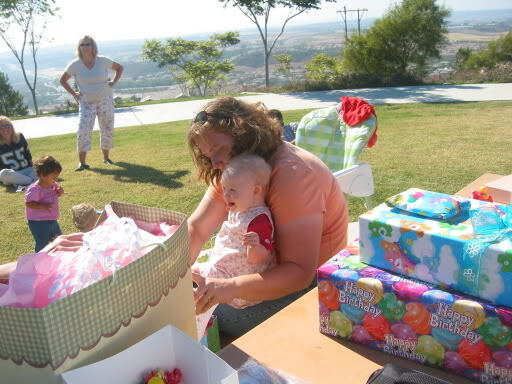 That's the ocean being masked by the haze in the background, and entirely too many presents in the foreground. Didn't anybody learn the kids just play with the boxes anyway? Hawaii may be paradise, but San Diego can see it from where we stand. Those pictures are absolutely precious. The cutest ones so far. Happy birthday to the birthday girl with hugs and kisses as well. Oh wow, she is too cute. If you could bottle her smile and sell it, then you'd be FIRE! Great photos, what a cutie Tori is! 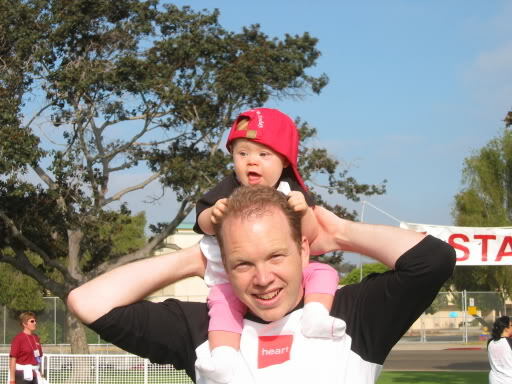 It's clear Tori has spent lots of time on daddy's shoulders as shown in the first picture. Couldn't help noticing that you, being the dedicated loving dad that you are, have suffered a little wear and tear from riding her around in this manner. It is understandable that you would lose some hair due to Tori's efforts to hang on for dear life, but I fear you've carried this a little too far and might want to consider wearing a hat to protect yourself from further deforestation. For you trivia buffs, the W.C. stands for William Claude. Ain't it wonderful what you can learn here? She's just precious. Happy first birthday Tori. Other than that unsightly growth underneath her in the first picture, its all cute! Mine wants to ride on my shoulders all the time now, and i've lost plenty of hair in that pursuit. Whats worse is that when he's up there, he's completely irresistible to every hot babe I come across. Alas, the benefit is self limiting. Yep, had I known about babies, I could have saved a fortune on sports cars, clothes and other obviously inferior 'helpers'. Had two absolutely gorgeous women come up to me in home depot the other day cooing at him. However, as stated, I might as well remove the gear and leave it at home with the wife. Oh, she is just sooo cute!! I am sitting here grinning at her picture. I want to hold and play with her. Enjoy every minute with her. They grow up way too fast.